More free instructions on card making will be added here as I make more cards to send out to friends whether as RAK (Random Acts of Kindness) or as swaps. Here you'll find step by step explanation on all aspects of card making. 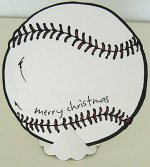 From the instructions here, you will be able to learn how to make cards for any occasion yourself. Just study each card-making instructions carefully and also look at the supplies needed for each of the projects or techniques listed below. If you have the required tools and supplies, you should be able to start straightaway and make some cards to send out to your friends or family members. Why Card Making As A Hobby? Card making is a great craft. A pastime that one can enjoy either alone or with other card crafters. It is a hobby that enriches the crafter and at the same time links hearts to one another through the joy of creating, sending and receiving. 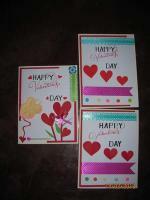 So follow the card making lesson plan and start making beautiful greeting cards. I have enjoyed this craft so much. Let me see. When was the first time I started making greeting cards? When I was a teenager. Those days, I loved to write poetry and make note-cards. But more than twenty years ago when I was far away from home, I regularly made my own greeting cards to send home. I remember cutting and pasting pictures from travel brochures to a basic blank card, adding a message and sending that handmade card home to my grandmother. My grandmother only read Mandarin and then, my Mandarin wasn't very good. So writing a short note in a note card is so much easier. At the same time I was able to show her where I had been with the pictures beautifully printed on the travel brochures. When I came home, I found that she had kept and treasured all those handmade notecards I sent her. 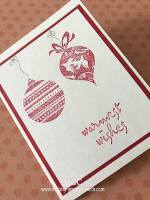 So I hope that you will enjoy these instructions on card making, learn a craft and reach out to friends and loved ones with your own homemade greeting cards. Card Making Supplies - Card making tools and supplies you will need to start making cards. Basic Blank Card - How to make a basic blank card to put your design on. Envelopes - Instructions on how to make your envelope especially if you don't have one that is the right size for your handmade card. Card Making Ideas - Create a sketch log to record your card designs. Make Your Own Backgrounds - Using colorful nail polish to create stunning backgrounds. More Background Ideas - How to make your own background paper. 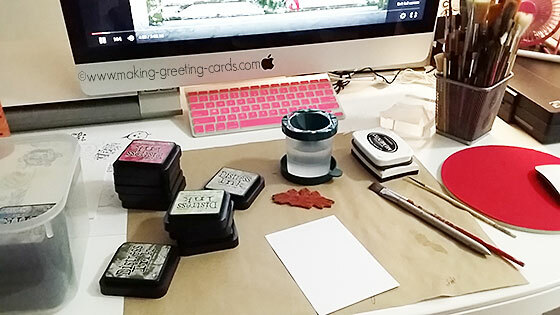 Rubber Stamped Cards - How to make cards with rubber stamps. Make Your Own Stickers - How to make your own stickers to embellish your cards or scrapbooks. Stenciling - How to use stencils. Paperbag Greeting Card - Simple directions for making a Paperbag Greeting Card provided by Susan Leader-Grace. Go Green - No rubber stamps? Here's a page on green stamping using vegetable as a stamp. Make An Origami Valentines Card - How to design and Fold a origami Happy Valentines card. I Love You Card - Say 'I Love You' with this Happy Valentines Card. Sticker Cards - Make quick and simple Happy Valentines Day's cards with glitter stickers. Great idea for making love cards. Mother's Day Card - Make a Happy Mothers Day beaded red heart card. Can be used for Birthday or Valentines cards also. Red Hats Cards - From computer Generated texts and graphics. Making Bookmarks - Make this beads ribbon bookmark for your friends! 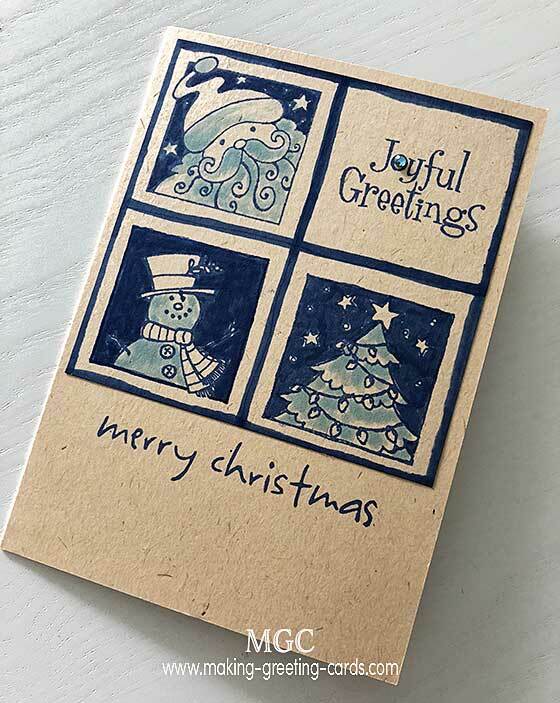 Japanese Rubber Stamps - Using your Japanese rubber stamps to make Asian greeting cards. Using Botanical Stamp Images - Two simple card making ideas for your botanical rubber stamps. Beautiful Dragonfy Card - How to make a dragonfly card using acetate and computer graphic. Nature Cards - Let nature inspire you! Make nature cards from leaves you picked during your nature walks. Great for kids too! Spring Cards - Spring is in the air! View these spring cards and get some inspiration to celebrate spring with your own beautiful handmade spring cards. A Butterfly Dream Card - Create this fun card! It's a one of a kind handmade card. Use any rubber stamps or cliparts. Make it your very own design. Japanese Style Spring Card - It's spring and I decided to make it a Japanese style card. Have a look and read the instructions on how I created it. 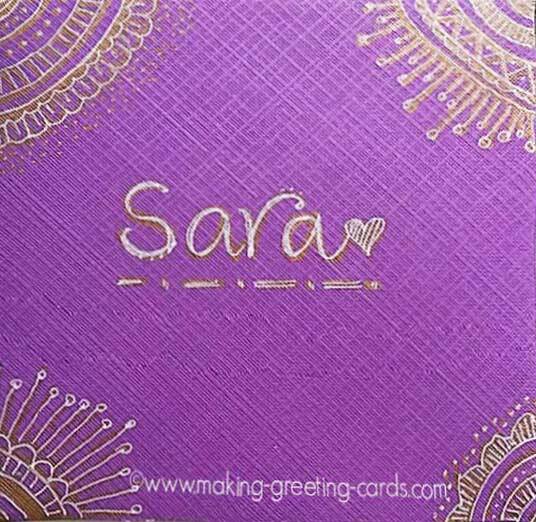 Henna Tattoo Card - Try making this fun card. Great for kids too - a henna tattoo card - not on your hand but on your cardstock. Have fun! More Henna Tattoo Card - Another henna Hand card; a colorful Happy Birthday card! Easter Card - A Happy Easter card; send an Easter egg in the post! More Easter Greetings - More Easter greeting cards to make and send out cards to wish others a happy Easter. Happy Mothers Day Card - Using a simple water color technique to color this rubber stamped Happy Mother's Day Card. Simple Birthday Cards - Here are some simple handmade Birthday Cards which you can do in one weekend. Button Cards - Some cards that are embellished with one or more buttons. Artist Trading Cards (ATC) Make and exchange Artist Trading Cards with friends online. Playful Shaker Cards - How to make Shaker Cards? These are Shaker Bookmarks but the technique is the same. Pink Dragonfly Tag - Tag! You are it! Make this pink dragonfly tag and send it flying to someone dear to you today. This card making website will be updated almost daily so do bookmark this website if you enjoy reading these instructions on card making. Also do forward this card making website to your friends who are into card making or those who would benefit from this site.